THURSDAYS WITH MOM & MICHAEL; A DAUGHTER'S LOVING TRIBUTE TO HER MOTHER'S WEEKLY DINNER PARTIES IN ASPEN is a mother/daughter project that won an IPP Gold Medal. My mother was a world-class hostess and I wanted to show off her exquisite talents for tabletop and entertaining. 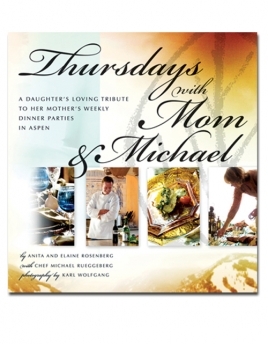 Each week in Aspen she hosted a dinner party for ten eclectic friends. In-demand private Chef Michael Rueggeberg was given a theme and mom designed the party and guest list. The result was a famed event that everyone in Aspen wanted an invitation to. Unfortunately, my mom's cancer returned after 30 years and she passed away early 2018. This book was very meaningful to her and we only have a few copies left to sell. In order to properly document these lavish events, we searched Aspen for the perfect photographer and found visionary Karl Wolfgang who brought these eventful evenings to life. 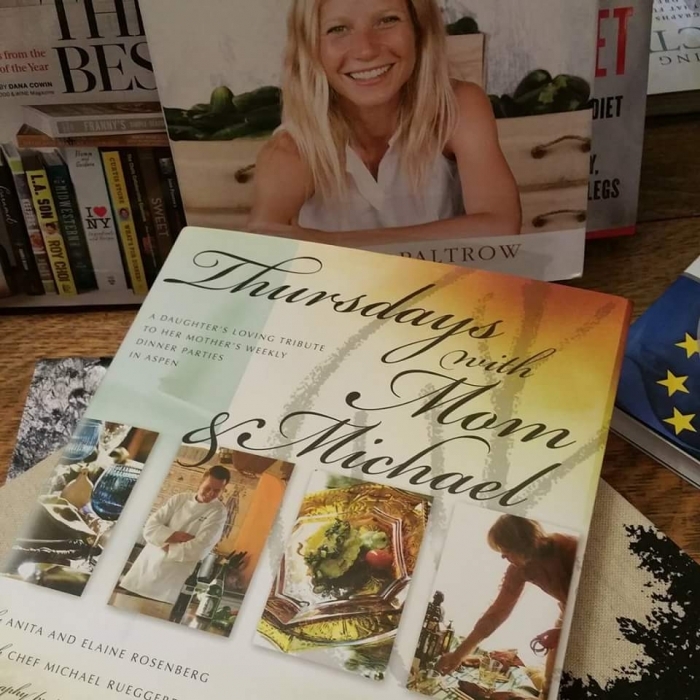 The end result is an award-winning book of my mother's beautifully themed tables and Chef Michael Rueggeberg's regionally inspired cuisine. It's a sumptuous guide for aspiring hosts and hostesses of all ages. Special note: all author's proceeds go to The Breast Cancer Research Foundation. As a breast cancer survivor, it was important to my mother that all proceeds from the sale of this book go to research. 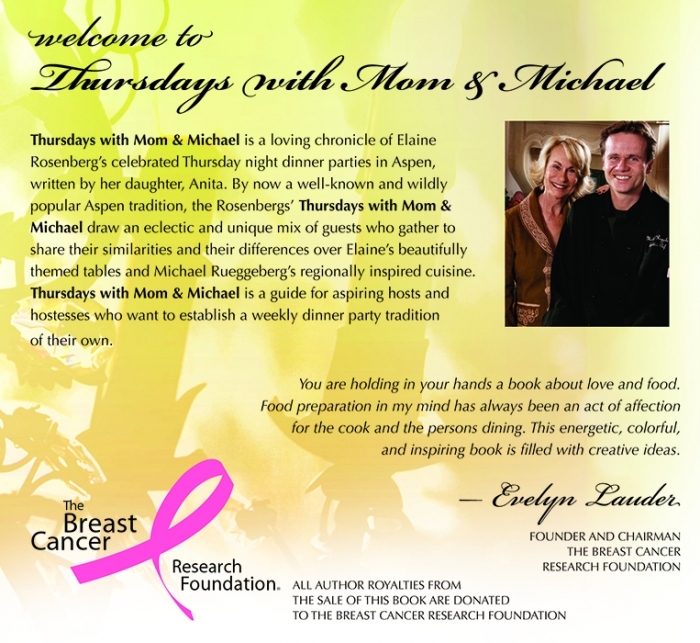 She chose the late Evelyn Lauder's BCRF.org because of its ground-breaking research and because she is a family friend with strong Aspen ties. Evelyn wrote our introduction and we proud to support a cause that speaks volumes to the forward-thinking and generous woman she was with our continued contribution. We also got a great shout-out from Felicity Huffman who also has strong ties to Aspen having grown up there. I even have a photo from a German Magazine with Sharon Stone and Melanie Griffin (another Aspenite) holding copies of our book they had just bought from me in LA. Thanks to all our fans. The Breast Cancer Research Foundation. Women everywhere will surely be grateful as well." "Your book is so lovely and your cause is so special." "I've been pouring over your beautiful book for days. It is so evocative and inspiring." great food, great life, and it's a great read.